The presence of ice-rafted sediments in deep-sea cores recovered from northeast Greenland, in the Fram Strait, and south of Greenland indicated the more or less continuous presence of either an ice sheet or ice sheets covering significant parts of Greenland for the last 18 million years. The oldest known ice in the current ice sheet is as old as 1,000,000 years old. The first key to unlocking this murky mystery is the mainstream statement that the Greenland Ice Sheet was formed in the Miocene. The Greenland Ice Sheet formed in the middle Miocene by coalescence of ice caps and glaciers. 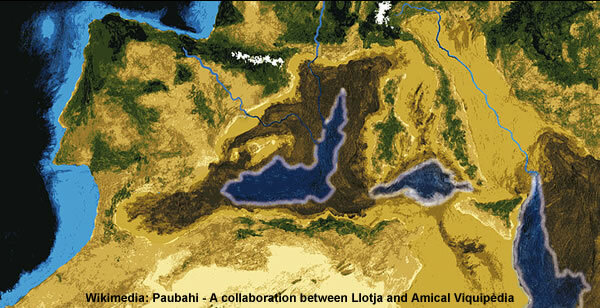 There was an intensification of glaciation during the Late Pliocene. Ice sheet formation occurred in connection to uplift of the West Greenland and East Greenland uplands. The Western and Eastern Greenland mountains constitute passive continental margins that were uplifted in two phases, 10 and 5 million years ago, in the Miocene epoch. Computer modelling shows that the uplift would have enabled glaciation by producing increased orographic precipitation and cooling the surface temperatures. Firstly: The Miocene is associated with a drop in sea level. 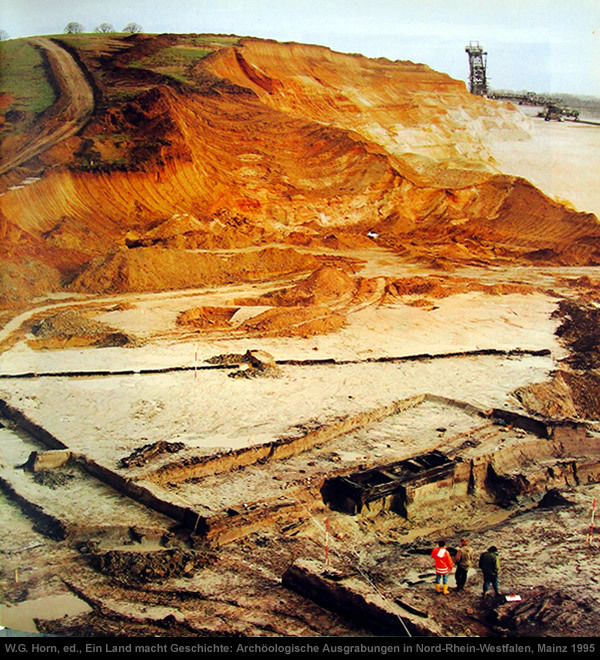 Secondly: A Roman aqueduct was found under seven metres of Miocene sand and gravel. The story begins with Ewald Ernst’s report of a Roman aqueduct that was discovered buried under seven metres of sand and gravel in a lignite strip mine outside Cologne, Germany. This inexplicable discovery then became a catastrophic problem for the mainstream when Louis Hissink reported the Roman aqueduct was buried under Miocene stratigraphy. The second key to unlocking this murky mystery comes from the Colle Gnifetti glacier in the Alps. The volcanic markers in the Colle Gnifetti ice provide the observational data necessary to produce a trend line that represents the self-organising properties of ice. It’s important to note the self-organising properties of ice are not a logarithmic function. The erroneous nature of logarithmic ice models is visually evident when they’re plotted linearly. Projecting the Colle Gnifetti trend line down to 3,000 metres suggests the bottom ice in the GRIP ice core is about 1,200 years old. The curve of the projected Colle Gnifetti trend line is similar to the outline of the Greenland Ice Sheet modelled by Willi Dansgaard. The curve of the projected Colle Gnifetti trend line is also similar to the ice depth-density curve but it suggests the Colle Gnifetti projection will overestimate the age of the ice at depth. Projecting forward the depth-density curve should provide a more accurate age assessment. The overestimate becomes apparent when the GRIP δ18O data is aligned with Leona Libby’s Old Japanese Cedar Tree Chronology. i.e. exactly the same age as the ice on Iceland. The age assessment is very similar to the δ18O trend line projection from Camp Century that suggests the Greenland Ice Sheet formed in 945 CE. a) The “Holocene” is the period since the Hecker Horizon in circa 1380 CE. b) The “Younger Dryas” (YD) and “Allerod/Bolling” (A/B) are the Hecker Horizon. c) The Eemian interglacial (“Eem”) is the Heinsohn Horizon in circa 914 CE. d) The last “Glacial” period is between the Heinsohn and Hecker horizons. Decoding the GRIP δ18O trace between the Hecker and Heinsohn horizons is particularly revealing. The extended range of δ18O values suggest ice was accumulating throughout the year. The mainstream interpretation that lower δ18O values during this period represent lower temperatures is contradicted by Leona Libby’s Old Japanese Cedar Tree Chronology. Therefore, the more likely interpretation is that the reduced sea-level during the “Miocene” [when the Greenland Ice Sheet formed] caused the precipitation to have lower δ18O values [via isotopic fractionation] because the location of the GRIP ice core site was then further inland. In Fig. 1.4 the primary evaporation takes place from a sub-tropical ocean surface to the left, and the horizontal arrows follow the humid air mass toward north while cooling to the dew point, when the first rain is formed (with δ = 0 ‰). During the proceeding cooling, when the air mass crosses a continent, or flows over the inland ice (to the right in the figure), or ascent along a warm front, it gives off precipitation and acquires steadily decreasing δ’s for both the vapour and the precipitation. 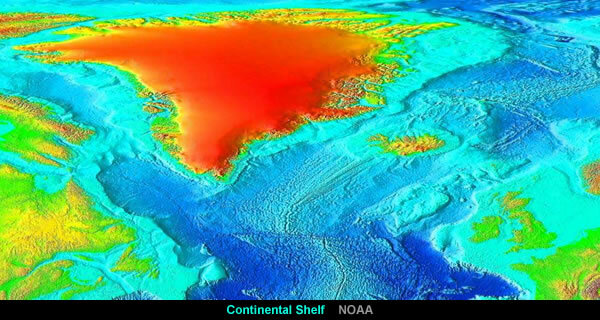 A continental shelf is a portion of a continent that is submerged under an area of relatively shallow water known as a shelf sea. Much of the shelves were exposed during glacial periods and interglacial periods. 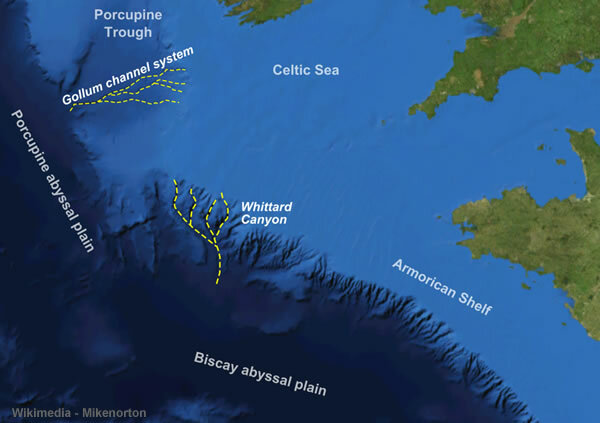 The depth of the shelf also varies, but is generally limited to water shallower than 150 m (490 ft). Coincidentally, the extended orbital periods of Comet Halley between the Hecker and Heinsohn horizons suggest the Earth experienced an orbital excursion with a shortened Earth Year of 355 or 356 days. The additional warmth and precipitation associated with this orbital excursion would have helped kick start the formation of the Greenland Ice Sheet. … the Earth experienced it’s orbital excursion between 914 and 1409. But, as always, readers should review the evidence and establish their own Ice Age Saga. Gallery | This entry was posted in Atmospheric Science, Catastrophism, Comets, Earth, Glaciology, Great Greenland Snow Job, Greenland, Hecker Horizon, Heinsohn Horizon, History, Iceland, Monte Rosa - Colle Gnifetti, Old Japanese Cedar Tree. Bookmark the permalink. I suspect Antarctica might also have a similar age. Well done sir! Intriguing. However before digging further there are a number of factors that have to be considered. Not least for erroneous ‘established’ data. 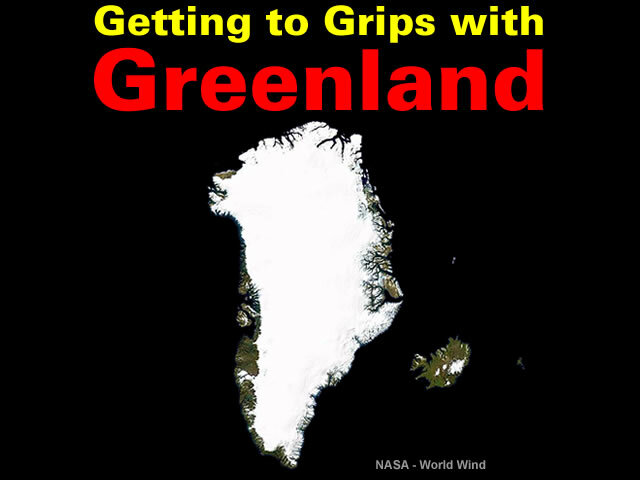 The first thing is the latitude of both sites with respect to the arctic circle (and its variation), and at what latitude in Greenland (between lat 60deg and 80). Then the need to consider that, contrary to established dogma on obliquity, this has changed repeatedly since the end of the YD, so that glacier waxing and waning has been going on on much larger scale. But saying so is meaningless without evidence, so here goes. since at least the early Holocene”. Note fwiw that AD1200 is peak Eddy cycle (warming), going to a cooling at cycle root ~1700 LIA. in atmospheric circulation and ocean dynamics, including abrupt cooling events, have punctuated the Holocene”. All dates are peaks and roots of the Eddy cycle (something I have only stumbled upon very recently from https://judithcurry.com/ ). Coincidence?? There have been multiple events in the Holocene, concurrent and consecutive, that would considerably impact on glacier ‘dynamics; all need to be taken into consideration.